Editor's note: This story is part of Southwest Michigan Second Wave's On the Ground Northside series. This story is written by Community Correspondent and Northside resident Patrese Nicole. Can you park in front of your home in the middle of the afternoon? Can you get dropped off in front of your home? What about your children, can they talk to their friends in front of where you live? Residents who live on certain blocks in Kalamazoo's Northside neighborhood cannot. What many people can do without second thought, residents can do only with the threat of police contact on certain parts of Mabel Street, Cobb Avenue, Williams Street, Norway Avenue, Drexel Place, Princeton Avenue, Elizabeth Street, Woodbury Avenue, Ada Street, Lawrence Street, Burrell Avenue, Paterson Street, and Church Street. The reason for this is No Parking/No Stopping/No Standing signs posted along these blocks. Basically, you can only drive a vehicle down these streets no matter what time of day or night. Signs that started as a solution to a problem have become a problem for residents, and worse. Many say the enforcement that comes with the posted signs have proven devastating for them. As one resident says: "It broke down my self-esteem." Another resident reported, "I looked at police different ... they just thought I was nothing. (The police assumed) I just had to be selling dope 'cause I'm black and walking with my friends." Today, residents of the community, Kalamazoo Department of Public Safety, and City of Kalamazoo all agree that the Northside is vastly improved from what it was once and plans are underway to replace the signs with those that make more sense for a residential neighborhood. In the early '90's the Northside looked very different. Imagine coming westbound on Paterson and seeing the wide streets as you approach LaCrone Park. During the summer months, the streets would be lined thick with cars on both sides. Sounds echoed from the hard-hitting bass of the cars' stereo systems, and people were out in droves. Hundreds of people and cars lined the streets so thick that it could take an hour to get through. Paterson was the strip and LaCrone was ground zero. Sgt. Pat Hall of KDPS says at the time “most people were there to socialize but the crowds offered a cover for a few 'bad actors' who would drink, use drugs, and fight.” Unfortunately, this was also during the crack era. Elizabeth Street was lined with dope boys. Addicts on foot would appear and disappear out of sight. Fiends in their cars would drive down the streets day and night. Sometimes there was more supply than demand. It was common to see five people run up to one car trying to make that sale. As residents say, it played like a scene straight out of a movie. Residents of the Northside say that like many other cities across the country, the landscape changed when crack hit. The community was devastated. Property owners scrambled to take back their yards and streets from a seemingly out of control youth and drug culture. Residents wanted a change. After certain members of the community voiced their concerns with KDPS the city put up No Parking/No Stopping/No Standing signs up around Paterson, Cobb, and Williams. The signs were intended to curb the congestion and deter the rampant drug activity. Some people were pleased with the results. But not all. The signs went up to instant protest and petitions circulated immediately to have them removed. The signs were only supposed to be there for 30 days, according to an article published in the Kalamazoo Gazette in June 1995. A week after the signs went up, then City Manager Mark Ott said the city would decide if the signs would stay. Almost 24 years later the signs are still standing. And although drugs are and have been sold in other areas across the community, the only residential areas in the City of Kalamazoo where these signs exist are in the Northside and one part of Hays Park in the Edison neighborhood. It’s uncertain which signs went up first. Some people say they went up first on Elizabeth Street. Others say they went up first around LaCrone Park. 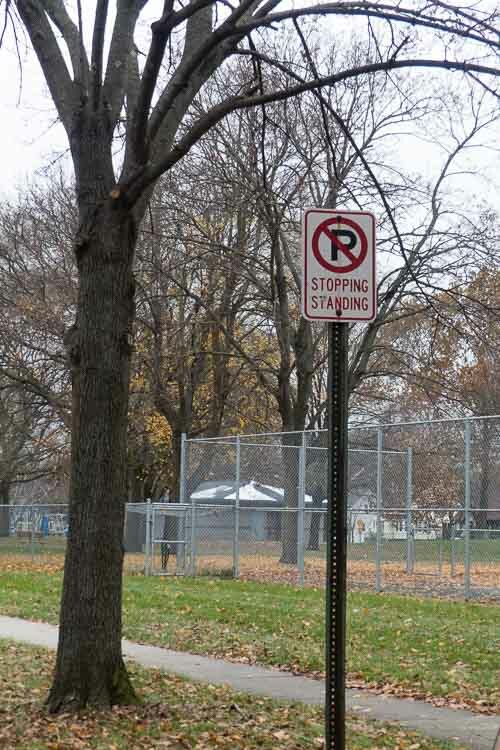 The City reports it does not have a record of the signs and says they do not know exactly where these No Stopping/No Standing/No Parking signs are located. What is certain is that over the years residents say the signs have infringed on the quality of their lives, and that of their friends, and families. Many black youth had their first police interaction as the laws behind the signs were enforced. Residents say that as KDPS has become less familiar with who actually lives in the community they have used the signs to profile. The signs went from offering people a sense of “protection” to becoming a source of harassment. Over the last 20 years, the landscape of the community has changed. If you ride by LaCrone during the summer you’ll see people playing basketball, kids on the slide, and you may catch a few people walking the track. Many people who live on the Northside are proud of where they live and have taken strides to rebuild their community. But as the neighborhood continues to build, the signs remain a constant reminder of the past. Residents who have been in the neighborhood since the signs were installed say they experienced complete changes in lifestyles. Family gatherings are limited because of a lack of parking. If your child gets dropped off by a coach they can’t sit and converse together. And talking with your neighbor in front of your home can be an issue. Although the "No Standing" part of the sign relates to vehicles, nearly all residents interviewed said they were targeted by police for standing with their friends or family in front of their own homes and the signs were used to justify police contact though the stops oftentimes don’t result in a police report being filed. Gathing says it frustrates him that KDPS picks and chooses enforcement of these signs. “Every day the mail person pulls up and parks their truck by my house (on Drexel Ave), without incident, yet me, a homeowner can’t enjoy the same right.” Gathing has lived at his residence for four years and has had contact with the KDPS three times due to these signs. The first time was the day he moved in. Gathing says a second officer told him to “move out of the neighborhood if they wanted to be able to park where they wanted.” He says he felt offended because he has pride in his community and chooses to live here. Yet he feels hopeless when the police department tells him to move away. 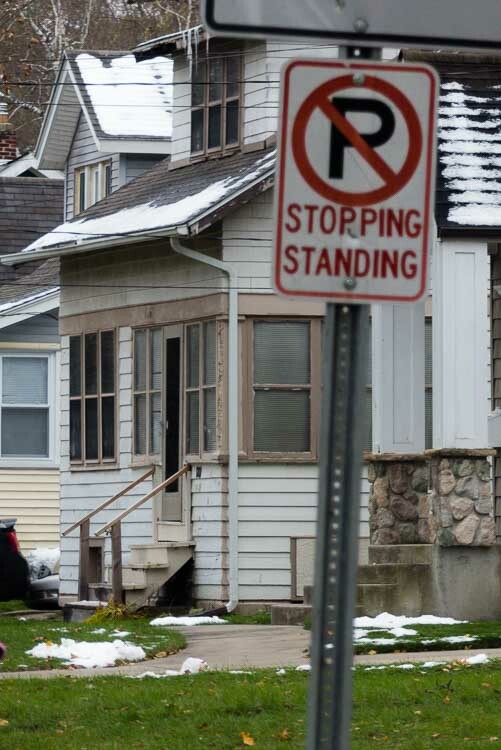 Residents find it difficult to do eveyday things like drop off their children with the No Standing signs in front of their houses.Stories of residents with physical impairments getting dropped off being pulled over by police also are common. “I remember I pulled over to drop somebody off and I got pulled over. The police said I’m not supposed to stop right there because of that sign when clearly he's seen me dropping somebody off,” says a resident who asked not to be named. “It’s almost as if they feel like we’re all criminals,” one resident says. Another says, “Black families get discriminated against for talking to their friends outside." That lack of success in getting the signs removed is partially because of the way the system is set up. Currently, it involves a petition process that calls for signatures of 51 percent of the homeowners on the block. The signed petition is then presented to the City of Kalamazoo's traffic board, which makes the final decision. It’s very well documented that communities of color, specifically on the Northside don’t boast high homeownership rates. 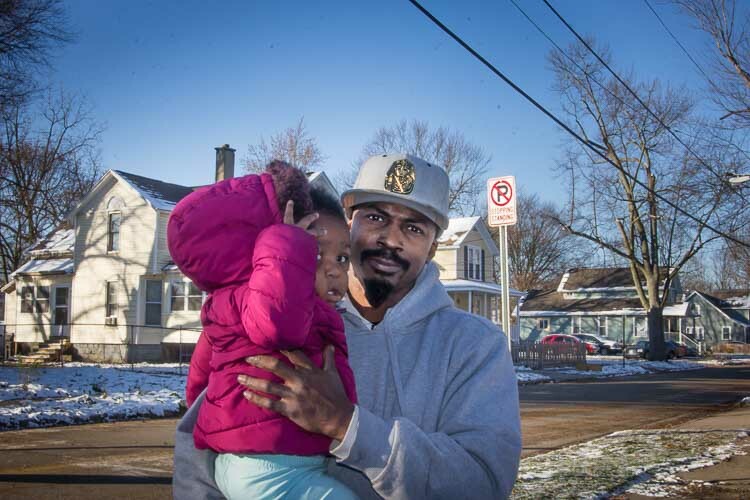 Some of the neighborhood's property owners don’t even live in Kalamazoo. Though many of the residents of the Northside aren’t homeowners they still have a stake and interest in their community. So the petition process as it stands does not allow those residents' voices to be counted. I am one of the people who live on a block with these signs. My family has been impacted by them. It didn’t sit right with us that you had to be homeowners in order for petitions to have the signs removed to be valid. My husband, Ed Genesis, and I went to the traffic board meeting in August 2018 to express our desire to have these signs removed. We asked that the petitions be reworded through an equity lens. Renters voices needed to be heard. Currently, the City Manager is reviewing the petition wording. No specific date has been set for his recommendation. The Traffic Board is conducting a traffic study similar to the one completed in the Vine Neighborhood in the fall. The Northside study began in early October. According to Eric Arnsman, Traffic Engineer with the City of Kalamazoo, the study is expected to be completed in January or February 2019 at which time new signs could be approved. Jim Baker, Public Services Manager for the City of Kalamazoo, says that no one currently in the traffic or city planning office was working for the city when these signs were erected. “We have a relatively new staff who was not aware of the signs as there were no accurate records,” Baker says. The city has agreed to include the No Parking/No Stopping/No Standing signs in this study and get an official record of where the signs are located. We Active!, a Community organization backed by Michigan United, has a Block by Block initiative that aims to engage and empower specifically Northside residents. We Active! will host conversations with people who live on the streets where these signs are located, KDPS, and the City of Kalamazoo to find out what kind of signs neighbors want on their streets. There is an opportunity to build and rebuild trust between the residents and the City and KDPS. The No Parking, Stopping, or Standing signs were erected 24 years ago when crack cocaine was epidemic. These conversations will explore solutions to replace the current signs with those that don’t infringe on the quality of life of the residents. Assistant Chief Vernon Coakley says, “KDPS is committed to and looks forward to working with residents of the community to discuss resolutions.” These conversations will begin the first of the year. Kik, Director of Community Planning and Economic Development, who is also a member of the traffic board agrees that this is a great opportunity to really hear from the people whose lives are affected and come up with solutions. “Instead of the typical petition process we have a unique opportunity to connect with the residents to decide what the community needs,” Kik says. In the City of Kalamazoo, unless there is signage that specifically allows it, a vehicle cannot be parked overnight on the curb. Residents say they would, at minimum, like to be able to get dropped off and picked up in front of their homes and possibly park there during the day. IIt will take take time for the City to get the information it needs to take action and in the meantime, residents are still left to deal with the impact of these signs. On Nov. 26 members of We Active! and residents will meet with KDPS and the City to discuss how enforcement will be handled until the signs can be removed. Another resident who did not wish to be named says she waits in the car for the bus to arrive with her 7-year-old whose bus stop is on a street with No Parking/No Stopping/No Standing signs. She recalls waiting in her car one day when the police stopped her. She felt embarrassment and shame as her son had to get off the bus to witness the incident. Only for her to have to explain to her son what happened. 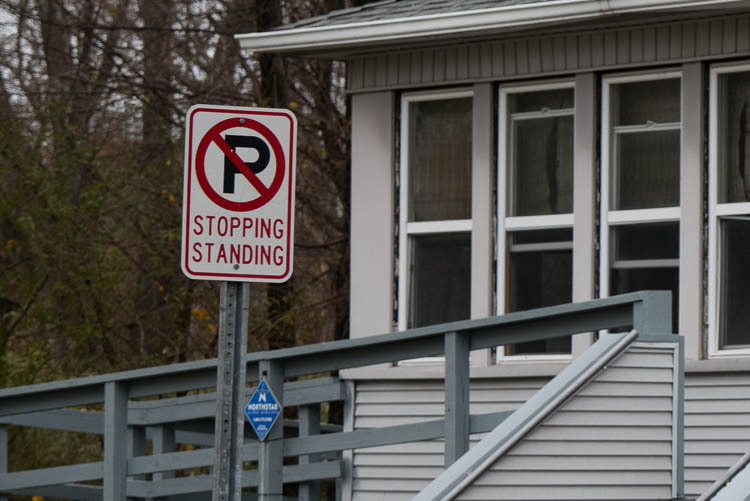 As one resident says, “If you were around Kalamazoo in the '90s and were North, then you had interaction with the police about those signs.” The No Parking/No Stopping/No Standing signs keep the neighborhood parked in the '90s. It’s time to move past what once was and move into the direction of what is. Read more articles by Patrese Nicole. Patrese Nicole is a Realtor/Housing Advocate and small-business owner who lives on Kalamazoo's Northside with her husband and children. "I've always enjoyed writing," she says. "I'm using my writing as a tool to change the narrative of those without voices." These signs are used in construction zones, industrial and some commercial areas.